My name is Kieran and I am seventeen. My main Volkswagen interest is the classic 'Beetle'. I do not yet own a Bug but I will soon. 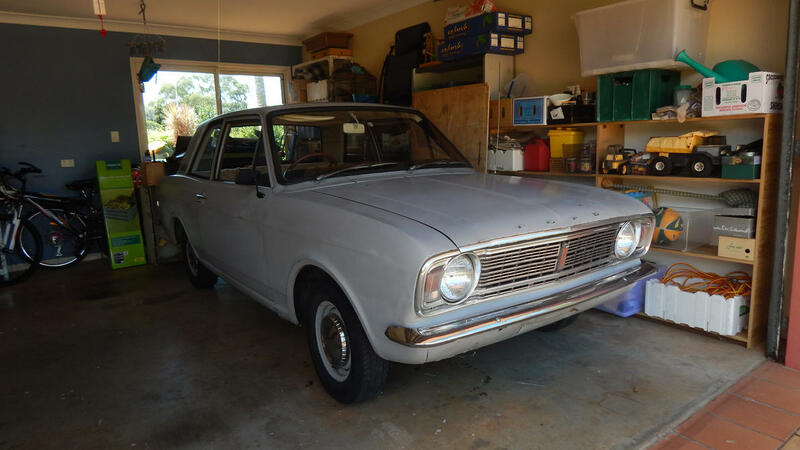 First, I have to practice mechanical skills and upholstery skills on a 1969 Ford Cortina. If I am found to be competent in car resoration, the money gained from selling the restored Cortina will be used to buy me a Beetle to restore. So I'm not currently actively searching for one to buy. I'm hoping for an early to mid sixties Beetle, preferably a '64. Before you recommend it, I will mention that I do have a copy of 'How to Keep Your Volkswagen Alive' by John Muir which I've been reading and studying. I am lucky in that a fellow Dubber lives just three houses down from me. He owns a yellow '75 'Superbug' and another Superbug that I do not know the year of (though '74 seems to stick in my mind for some reason). What's interesting is that the reasons he prefers Superbugs over the original 1200 are the exact same reasons that I do not favour them! His yellow '75 is the car in which I showed up to my Grade 12 graduation. It was incredibly, err, cosy (I'm 6ft 3) and we had to nearly yell at each other while tearing along the highway to hold any kind of conversation. What fun! I've attached an image of it for those interested. Anyway, thanks for reading and letting me introduce myself. I hope this forum and its members will become a valuable asset when I get my own Bug. "I can't drive fifty-five, because it only goes thirty-eight." Welcome Cap'n, and congratulations on a very well-written post. Just found this post, I'm the fellow Dubber, just recently joined this site, although I don't qualify as a young dubber and so don't frequent this section . The "other" Superbug was a '73 and has now been sold on. They are indeed fun cars! Here's a shot of the two before I sold "Phoenix", the orange one. The yellow one is yet to be named, although I'm toying with "Bumblebee". Phoenix was my 1973 Super Beetle. _______ is my 1975 Super Beetle. welcome aboard the love dub! great story and we look forward to your purchase and subsequent resto.. Thank you very much, Pauly! I'm quite excited about learning some mechanical skills and getting a Beetle. The chances are it will be my first car, too. I was very fortunate in that Timothy bought his '75 Superbug just a couple of weeks before the Formal. It was fantastic that I was able to go in his car; it was a great evening. How excellent it was, to stand out from all the modern and silly (and rather ugly) Chevrolet limousines in a bright-yellow and very noisy Super Beetle! Pauly (I do hope you don't mind me calling you that, after all you did type it first! ), I'm glad you liked the story. I'm just starting in the Volkswagen scene and I've already learned a lot in this year and last. Getting "How To Keep Your Volkswagen Alive" has been one very good learning tool and I hope these Forums will be another! Thanks for the recommendation regarding looking out for cars for sale here as well as DumbTree and EvilBay; I will certainly keep an eye on the for-sale ads here once the time comes. And thanks for reading and taking the time to reply. Welcome Kieran, methinks you may have a future with the written word, good luck with your quest for motor vehicle skills. You do think I have a way with words? And here I am studying IT at TAFE like a sucker. In Grade 7 I was voted to have the largest vocabulary of anyone in the school - including the teachers - backed up with an excellent knowledge of how to use all those different words. And in Grade 3 I took a test that determined that I had Grade 9 level English skills. Apparently I even corrected some errors on the test sheet itself! So, maybe I do have a future in that area? Anyway, thanks for reading and replying. 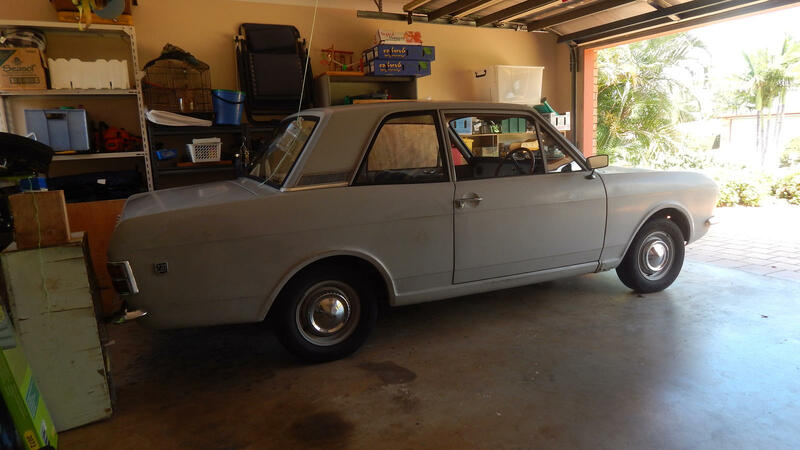 Well, last night the 1969 Ford Cortina (mentioned in my first post, briefly) arrived. It will be my joint project with the owner, Clive, for the next 12 months or so and I hope to learn many new skills while working on the car. Once it's restored, I'll be able to get a Beetle! When you're ready to start looking for a Beetle, don't dismiss eBay and Gumtree, many a bargain to be had, but you must inspect your prospective purchase in person. Many cars photograph well, only to find it riddled with rot. Buy the most rust free and unmolested car you can find (unless it's been modified to your taste). Also be vigilant for illegal / unregisterable mods regardless of what the owner tells you. Ask the Dept Transport / engineer first. always going to be a tight squeeze. First of all, thank you for the warm welcome. I do indeed have a few 'spelling nightmares', usually accompanied by 'grammar nightmares', on this site. My solution is to only look at the photographs! Thank you for the advice, I am certainly not going to dismiss EBay and Gumtree. Looking at a car in person before buying it is really just common sense (which isn't all too common these days! ), I believe. Take the Cortina for example; it looks alright in that photograph but there's some rust (including a spot in the floor we'll grind out and patch up, though I won't be allowed to do so) and some parts missing inside. I'm after a Beetle that's as original as possible as I would like to do a stock restoration; I'm not one for modifications. The most I'll change is the paint colour! I am pleased to hear that you recommend the Cortina as a good classic automobile to learn in. It is the only manual car we have access to and so I will probably use it for a little while to get the hang of driving a car with manual transmission. A Beetle is a bit of a squeeze for me, but I do fit well enough and it surprised me when I found out. Fortunately it wiill not be my daily drive, merely a fun car for weekends (and dates, when I get my P's; girls love Beetles. ). Thank you, I will keep that in mind. I can see it saving a lot of bother, and for only $5 too. don't quote me on that number, it might be more, but it was cheap! I have seen it for myself and I can confirm the price. By the way, can I come over one day when you're working on your Beetle? Clive and I won't start working on the Cortina for a month or so. We've got to jack it up and put the wheels on dollys first. Alright, I have managed to locate the information I made reference to earlier. The service I found is the Personal Property Securities Register. It costs less than five dollars and allows you to see if the car is stolen or has been written-off. So, that's that little matter cleared up. That's the one, REVS check is an old term, but it's easier to say than the new one, so it somewhat erroneously persists. BTW, rather unusually I'm doing some "actual work" on my bug tomorrow, as my accelerator cable snapped and so I need to replace it, so if you want to drop by. I need to buy some parts in the morning though, so might not get to it until the afternoon, just PM me on here if you want to drop by, so you come when I'm actually working on it. She's actually a 220, at least that's what the badge at the rear says. Hopefully the restoration will be fairly quick so that we can sell it and buy a Beetle for myself. I bought mine of "dumbtree" and no it wasn't a bad purchase is what you said only because you favour this site??? I bought my first bug from gumtree.